I’ve been making all our bread exclusively for about two years now. You’d think I’d have the hang of it. Lately I’ve not been happy with the rising of my loaves. (Luckily it hasn’t affected the taste.) I read recently on AllRecipes about the difference in handling “lean” doughs as opposed to “enriched” doughs. Enriched doughs have some kind of fat… either butter, milk, oil or eggs. (I’ve also heard that honey slows the rising of bread doughs.) The trick is to hydrate the flour first in the water/yeast mix to develop the gluten strands before adding the fat. I did that with this Cheese Bread and the result was terrific. A great rise. The taste and texture were very nice but ultimately not that cheese-y. (The recipe was from a cookbook and I won’t bother to post it.) I really love cheese bread toasted so I’ll have to keep looking for a good recipe. Since Valentine’s Day is later this week, I’ll have to lead with the chocolate… soufflé, that is. I made this Saturday night for some friends we had over for dinner. It is quite nearly perfection. It’s everything you want in a heavenly chocolate dessert. It’s dense yet light. It’s creamy but has body. It’s ridiculously chocolate-y but not too sweet. I used two-thirds bittersweet chocolate and the rest semi-sweet. For the six eggs, I used three of our largest duck eggs. It came out of the oven about 10pm or I might have gotten a photo before consumption. I recommend a dollop of lightly sweetened cream or a scoop of good vanilla ice cream to melt lovingly over the top. It’s going to take an amazing amount of self-restraint to not eat this for lunch. Anyway, I highly recommend you make this for any Valentine that enjoys loves adores worships chocolate. Next, I made myself this bag. I’m too impatient to search for a pattern that has everything I want, so I engineered this one myself. I knew the size I wanted and a few details and I just gave it a whirl. I should have made a muslin version to test everything out but did I mention I’m impatient? I had some extra home dec weight yardage and I decided to go for it. It’s not my favorite fabric so if it didn’t turn out I wouldn’t be too sad, but if it did, it would be servicable. It’s really not all that bad. A few finish things can be addressed. I haven’t decided on a closure yet, button or magnetic clasp. The strap is too wide and some interfacing would give it more body. But overall, not bad. The last bag I made was supposed to be a spring/summer bag to be followed by a fall/winter bag. My two season bag has lasted two years. It’s just starting to show some wear and I needed a replacement. I have some other fabric I like that I’ll try to perfect this with. I haven’t posted about food in a while. Maybe overload on the holidays. I have had a few successes… and failures. And of course, I never remember to photograph them. My mother-in-law gave me this booklet and I was excited to try some new recipes. Let’s start with the good news first. I made sourdough bread without additional yeast for the first time. It was a sandwich bread which had a softer crumb. The recipe indicated a 5-6 hour cycle from start to finish. Mine was over 11 hours. I barely got it out of the oven before I went to bed. I was really surprised because I put the dough to rise on the wood pellet stove, nice and toasty warm. It was a good loaf. The next quasi-success was a sourdough skillet biscuit. It had great sourdough flavor but was quite dense, a little more than my family liked. The abject failure was sourdough chocolate cake. I have never in my life thrown away three quarters of a chocolate cake. It saddened me to do it. The instructions were specific on the order of ingredients but I’m sure that’s where the problem was. I was to add flour and sugar to a half a cup of starter. This made for a thick, lumpy mix. A thick, lumpy mix that was not remedied by the addition of the wet ingredients. It formed small, dense balls of dough within the cake. The taste wasn’t that objectionable but the consistency and appearance was awful. Even the kids wouldn’t eat it. I actually have a picture of the cake but it’s so unappetizing that I don’t want to post it. The insanely addictive Christmas appetizer (which I made for two gatherings) is Buffalo Chicken Dip. If you really like chicken wings and blue cheese and have self-control issues, don’t read further. I may make it for the Super Bowl but then I have to lay off it. Of course I changed things after reading the reviews as I often do. Here’s my version. Mix one 8 oz. block of softened cream cheese with half a jar of Marie’s Super Blue Cheese salad dressing. Add chunks of real blue cheese if you really want to go crazy. (Who doesn’t like lots of stinky cheese?) Spread in an 8 x 8 pan. Shred one cooked boneless chicken breast and toss with Texas Pete’s hot sauce to moisten, more or less to taste. Top with a handful of shredded cheddar cheese and heat in a 350 degree oven for 20-25 minutes. Serve with celery and carrot sticks, dipping crackers or just a spoon (when no one is looking.) Enjoy! I’ve been MIA with holiday preparations and tending boys. I have decided that I did not, in fact, give birth to two beautiful, healthy boys. Instead I merely unleashed two relentless forces of destruction into the world. In an attempt to harness some of this energy, I got them both kid-sized shovels. Here’s my three boys taking a first stab at the foot of snow that fell this weekend. There’s another 6-8″ on the way today so they’ll be out again for sure. As a snowy day activity, we made 5 dozen sugar cookies (same as the Easter cookies) the other day and frosted them. Doing anything with children under the age of five is like doing water ballet in quicksand. I had envisioned festive holiday shapes in red and green. Silly me. The big boy found the giant bucket of 30 cookies cutters I got on sale once and insisted on using every single one. We have dinosaurs, ice cream cones and dog bones absolutely dripping with icing and sprinkles. Now if that doesn’t say ‘Merry Christmas’ then I don’t know what does. I’ll post a picture soon. I still haven’t finished all my holiday sewing. Next week I will have to take my machine in for a long overdue service. It’s just limping along reluctantly now. Then I’ll need to finish up the nine patch and dinosaur quilt as soon as I get my machine back then start on a quilt for my sister in law. I orderd some hard-to-find bird fabrics from LuckyKaeruFabric’s Etsy shop and they are so incredibly gorgeous that I can’t imagine cutting them up. The camera (and my shoddy photography) does not do them justice (drool, drool). Hopefully today I can enjoy a snow day of sewing while the boys are out with their shovels. Another worthwhile use of duck eggs…. 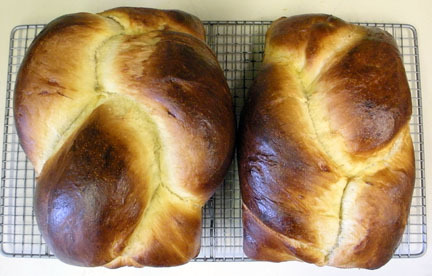 challah. The 8+ cups of flour nearly bested my KitchenAid mixer. 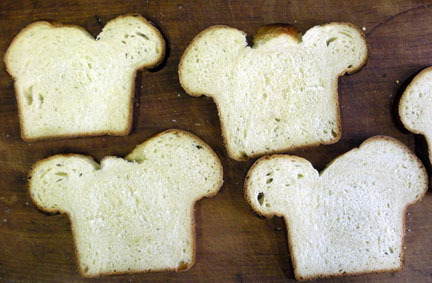 I put the braids in loaf pans so that I could make toast and sandwiches. It made for some crazy poofs during that last oven spring. I made some delicious french toast this morning which the boys gobbled happily. It also made for a fine grilled cheese and tomato sandwich for lunch. Gotta use the last of those garden tomatoes. Yum. The ducks are laying about three eggs a day right now so I’m trying to keep on top of things. 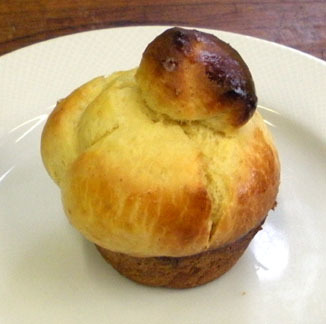 In addition to a Mushroom and Swiss quiche, I made some brioche – a French sweet roll of sorts. They’re cute in their little hats and yummy to boot!